The contemporary ‘global’ design of this sophisticated yacht has been created by prestigious Icelandic designer Ingibjörg St. Palmadottir. BLISS’s main saloon sets the tone for the rest of the yacht’s interior. It features sturdy contrasts comprising of hard and soft colors and textures with quality furniture and a unique finish. The elegant dining area with a circular table and stylish black leather chairs is located at the aft of the vessel, toward the main deck aft. The upper lounge features a long, mirrored bar and mirror insets between the windows cleverly providing an uninterrupted view. The upper Saloon can also be used as an extra guest cabin. An airy stairway constructed of granite, mirrors and stainless steel dominates the foyer, which is one of the most dramatic spaces on board with lights inlaid in Absolute Black granite along with smooth silk wall coverings. Luxury Heesen motor yacht BLISS can accommodate up to 12 guests in 5 glorious cabins including her majestic master suite. The limited color palette of white, black, silver and dark lavender is incorporated effectively in the full width Master Suite located on the main deck. A sliding bed table is a practical element of this elegant suite. Just aft of the master suite is an accommodating office space with his-and-hers workstations. 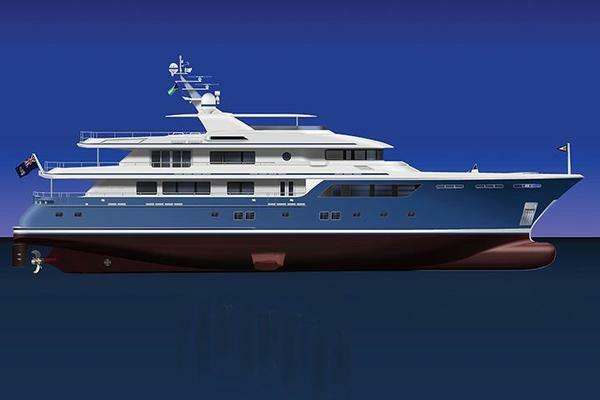 The remaining cabins are located on the lower deck and include 3 double cabins and a bunk room perfect for children fitted with rare onyx, offset by rosewood. Each cabin has a different color scheme executed in exotic wall coverings, and are extremely soundproof. Guests onboard appreciate luxury motor yacht BLISS’s abundant deck space including an al fresco dining areas with an unbeatable view. The deck areas have been customized by the designer to maximize guest enjoyment. Areas which are often reserved for more technical uses or storage have been redesigned to provide a remarkable choice of sophisticated sunbathing and lounging options. United Yacht Sales New Jersey would love to guide you through a personal showing of this 144' Heesen 4400 2007. 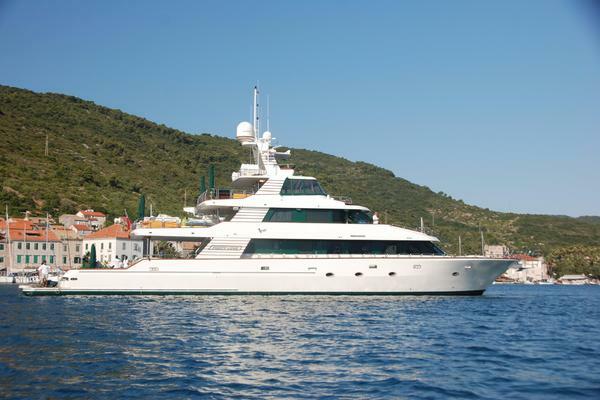 This yacht for sale is located in Southern Europe (cruising) Greece and priced at $12,500,000. For a showing please contact us by filling out the form on this page and we will get back to you shortly! Voltage:230/400 V Frequency:50 Hz Shore power converter:MarPower SPC-11, 20-300 kVA Inverter:2 for AC (OMRON-F7C), 2 for Stabilizers (FDU EMOTRON), 2 for EVAC System (DANFOSS VLT2800) Batteries:Mastervolt Chargers type 24VDC/ 1x20A, 1x15A, 1x50A, 2x25A, 1x75A. - Two sets of 24V-100Ah starting batteries, make Optima, type 850S gel for the portside and starboardside main engines and generators, charged by the alternator on the generators. Total: 8 batteries of 12VDC-50Ah, located in the engine room. - One service battery set 24V-600Ah, make Sonneschein, type gel for navigation lights, auxiliary circuits, electronic/nautical equipment and 24VDC lighting. Charged by the alternators from the main engine or battery charger. Total: 6 batteries of 12VDC-200Ah, located in the engine room. - One emergency battery set 24V-400Ah makes Sonneschein, type gel, for radio/emergency service, charged by battery charger. Total: 4 batteries of 12VDC200Ah, located in the wheelhouse. - One emergency GMDSS battery set 24V-55 Ah makes Sonneschein, type gel, for emergency service after 8 hour emergency, charged by battery charger. Total: 2 batteries of 12VDC-55Ah, located in the wheelhouse.